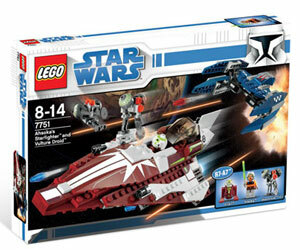 Description Of Item: Using her wits, piloting skills and Jedi training, Ahsoka flies her Clone Wars starfighter in a daring space battle against Separatist droids. Fire the flick-launching missiles, but watch out for the buzz droids! Vulture droid converts from fighter to walker mode! .